To work with modern wireless networks such as UMTS and LTE, it is essential that the telecom professional has full understanding of its basic concepts, such as those that control the call establishment and maintenance, whether it is voice (CS) or data (PS). n this scenario, RAB and RRC are two of the most important concepts because they are responsible for all the negotiation involved in those calls. In addition to RAB and RRC, we still have some other terms directly involved in context, as RB, SRB, TRB, among others. These terms are also important concepts, since without them RAB and RRC could not exist. So lets try to understand today – the simplest possible way – what is the RRC and RAB role in the calls of these mobile networks in practice. As it become necessary, we will also talk about other concepts. To start, we can divide a call into two parts: the signaling (or control) and data (or information). Already ahead of key concepts, we can understand the RRC as responsible for the control, and the RAB as responsible for the information part. As mentioned, other auxiliary concepts are involved in calls, but our goal today is to learn the most basic concepts – RRC and RAB, allowing us to evolve in our learning later. Oddly enough, even professionals who already work with UMTS-WCDMA and LTE networks have trouble to fully understand the concepts of RRC and RAB. And without this initial understanding, hardly they can evolve with clarity and efficiency in their daily work. Without further introduction, let’s go straight to the point and then try to understand once and for all these so important concepts. As always, and as usual the telecomHall, let’s make an analogy that helps us to understand the functioning of the RRC and RAB in practice. Let’s start imagining the following scenario: two people are cut off by a cliff. 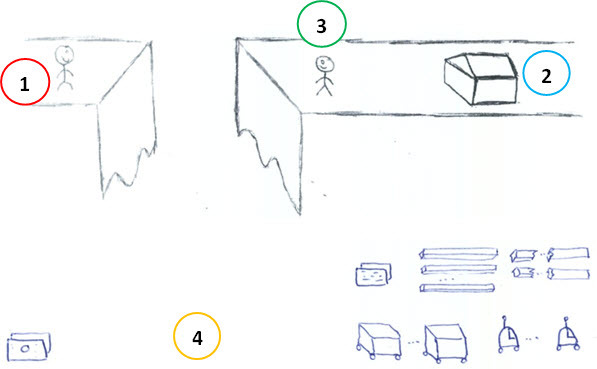 On the left side, a person (1) want to buy some things that are for sale in a store (2) or deposit on the right side. In the right side, in addition to the deposit, we also have a seller (3), which will help the buyer to contact (negotiable) with the deposit. As additional or auxiliary objects (4), we have some iron bars with different sizes, and some cars – some like train wagon, others like remote control cars. In short, we have the situation outlined in the image below. And so, how this situation can be solved? Let’s continue with a possible solution: the buyer on the left write his request in a note, tie on a small stone that he found on the floor, and send (1) it to the seller on the other side. So, the stone carry the information or initial request. The seller receives the request, but she need to send it to the deposit, in order for the shopping to be sent. She sends the request on a remote control car (1), which run a previously demarcated path to the deposit. Some time later, the deposit response arrives to seller (1), which then checks to see whether she will be able to send the data or not. So that we can proceed with our call, let’s consider a positive response. That is, what the buyer is willing, or the ‘resources’ are available. Seller realizes that to fulfill the request, and be able to send the purchases, she will need to build a ‘path’ (1) between the two ends of the cliff, so the wagons could carry over with the orders/receipts and purchases. Then, the seller uses some of its iron bars and creates a link between the two sides. Once established all the way between those involved, requests can be sent from both sides as well as the purchases or any other information can be transferred by different paths and wagons/cars! If you managed to understand how the above problem was solved, congratulations, you just understand how the most common form of UMTS-WCDMA and LTE communication happens! Although analogies are not perfect, it help us a lot to understand the complex functioning of these networks, especially in relation to new concepts such as RRC and RAB, but also a very often used, the ‘bearer’ — so much that it’s worth talking a little bit about it. If we search the word ‘bearer’ in the dictionary, we’ll find something like trasnporter, or carrier. In a simple way: one who carries or conveys something from some point to another point. 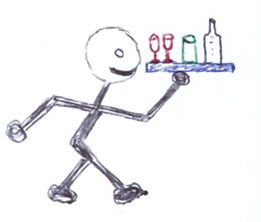 In a restaurant, we can compare the ‘bearer’ to a waiter. But from the telecommunications point of view, ‘bearer’ is best understood as a ‘pipe’ that connects two or more points in a communication system, through which the data flows. Technically speaking, it is a channel that carries Voice or Data, a logical connection between different points (nodes) that ensures that the packets that are traveling have the same QoS attributes. Explaining better: for each ‘bearer’ we have several associated parameters, such as the maximum delay and packet loss limit – and these attributes that make sure each packet going in the same channel have the same QoS attributes. Now that we know what is bearer, let’s go back to the analogy presented earlier, but now bringing it to the real, more technical side. All that we’ll talk can be summarized in a single figure, having all the concepts seen today, and that will be detailed from now on. Note: If you manage to understand the concepts that will be explained in the figure below, you will be with a great base for both WCDMA and LTE networks. This is because, in order to facilitate we use WCDMA nomenclatures, but the principle is pretty much the same in LTE. Just do the equivalent replaces, like NodeB for eNB. On that ficticious scenario, the seller is the UTRAN, responsible for creating and maintaining the communication between the UE (buyer) and CN (deposit) so that the QoS requirements of each are met. The cliff is the Uu Interface between the UE and the UTRAN, and the road through the remote control car goes until the deposit is the Iu Interface, between the UTRAN and CN. Sending requests and receipts is part of signaling, or the RRC. The shipment of purchases is the data part, or the RAB. In our scenario, the RRC are the Rails, and RAB is the full service of sending data between the UE and the CN. Note: the RRC is in Layer 3 – control plane, while the RAB occurs between the UE and CN, in the user plane. The railcars are the RBs, and convey the information in the radio path. These wagons define what type of thing will be transported, and in what quantity. Similarly, the RBs define what type of data will in the RRC, which can be Data or Signaling. When the QoS attributes change, then the Rbs associated with that RRC connection need to be reconfigured. The remote control cars are the Iu bearer, and carry information on Iu Interface (between the UTRAN and the CN), either CS or PS. Note: RAB is the combination of RB and Iu bearer. The Conversational RAB and the Interactive RAB can be used together, and in this case we have a case of MultiRAB. The RB is a layer 2 connection between the UE and the RNC, and can be used for Signalling and control User Data. When it is used for Signalling or Control Messages is called SRB. And when it is used for user data is called TRB. Note: in an optimized network, we can find much of the traffic being handled by HSPA bearers, even MultiRAB. This option frees resources from CE (Channel Elements), relieving the load on R99 (that can only use these resources). However, it should be done with caution, because if improperly configured it can degrade the Performance Indicators with Blockage (Congestion) and Failures. As you’ve probably noticed, we’re talking about several new technical terms, but these terms are what you’ll find for example when reading UMTS or LTE call flowcharts. But if you can understand at least in part the concepts presented today, everything will be much easier. Let us then take a look again on our figure, and continue our analogy. As we saw, in telecom we work with the concept of layers. And this way of seeing the network brings us many advantages, mainly because we were able to ‘wrap’ physical access. In this way, any modification or replacement can be made with less complexity. We don’t need to tell you how much the radio path is complex, continuously changing, right? This structure using beares ensures this simplification: the RNC and CN bother with QoS requirements in the path between them (Iu Interface); and only the RNC have to worry about meeting the complex radio path QoS. Sure, but why we have two types of carriers – wagons and remote control cars? The answer to this is in the very characteristic of the two existing paths. Being the Iu a more robust interface, and also because we have major changes in RABs during connections, it is normal that these bearers are also different for the paths. it’s like using a 4×4 pickup truck to climb a mountain, and a race car to an asphalt race. Regardless the carriers, with the RAB the elements of the CN has the impression of a physical path to the UE, so don’t need to be worrying about the complex aspects of radio communication. For example, a UE can have 3 RABs between he and the RNC, and these RABs may be changing, as in the case of soft handovers, while the RNC has only 1 Iu bearer for this connection. From the point of view of the carriers, the main task of the UTRAN is managing these services on these interfaces. She controls the Uu interface, and along with the CN, controls the provision of services in the Iu interface. Remember that in a communication between the UE and the CN, several other elements are involved, mainly to negotiate QoS requirements between both parties. These requirements are mapped in the RABs, that are visible to both (UE and CN), where the UTRAN is responsible for creating and maintaining these RABs so that all of this is served in all aspects. A RRC connection exists when an UE performs the call establishment procedure, and get resources from the UTRAN. When a RRC connection is established, the UE will also get some SRBs. (If for some reason the initial request is not accepted, the UE can make a new request after some time). Since the SRB was established between the UE and the CN, the RNC checks a series of information such as the UE identity, what is the reason for the request and whether the UE is able to handle the requested service. The RNC that maps the requested RABs into RBs, to transfer between the UE and the UTRAN. In addition it is also check the attributes of the RABs: if they can be met by the available resources, and even whether to activate or reset radio channels (reconfiguration of lower layers services ) based on the number of Signaling Connections and RABs to be transferred. This way, it creates the impression that there is a physical path between the UE and the CN. Remembering again that no matter how many signaling and RABs connections there are between the ue and the CN – there is only a single RRC connection used by the RNC to control and transfer between the UE and the UTRAN. Now that we have seen a lot about RRC and RAB, let’s learn only a few more concepts today – after all, we already have enough information presented. Let’s talk about the AS and NAS. At this point of view, the AS provides the RAB to the NAS, or information transfer service. The UE and CN need to communicate (events/messages) with each other to perform several procedures with many purposes. And the ‘language’ of this conversation between them is called protocols. The protocols are then responsible for allowing this conversation between the UE and CN, and cause the CN do not worry about the method of access (be it GSM/GPRS, UTRAN, LTE). In our case the RNC acts as a protocol – between the UTRAN and CN. Between the UE and the UTRAN: within the RRC connection. 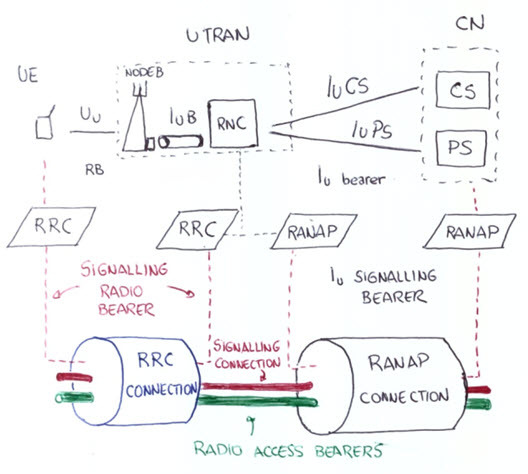 The RRC Protocol is responsible for negotiating the (logical) channels of Uu and IuB interfaces, and for the establishment of signaling dedicated channels as SRBs and RBs among these interfaces. Between the RNC and the CN: after being negotiated and mapped, in the RANAP protocol connection, through Iu interface (CS/PS). As we have seen above, the RNC maps requested RABs into RBs using current radio network resources information, and controls the services of lower layers. To optimize the use of these resources, as well as the network band and physical resource sharing between different entities, the UTRAN can also perform the function of CN messages distribution. For this, the RRC Protocol transparently transfers messages from CN to the access network through a direct transfer procedure. When this occurs, a specific indicator of CN is inserted in these messages, and the entities with the distribution function in RNC use this same indicator for direct messages to the appropriate CN, and vice versa. But now it started to get more complex, and we have already reached our goal today, which was to learn the basics of RRC and RAB. Everything we just talked about above can be seen again in the same figure below, the same from the beginning of the explanations. RRC and RAB in GSM? Okay, we understand how RRC and RAB works in UMTS-WCDMA and LTE networks. But in GSM, does we have these concepts as well? At first, the answer is NO. However, with what we learned today, we can make a comparison with some GSM ‘equivalent’ parameters. 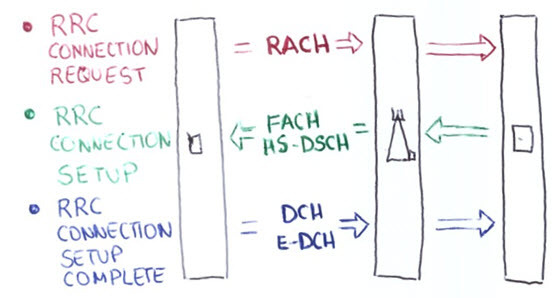 We can compare the SDCCH phase and TCH phase of a GSM call with RRC and RAB in UMTS. RRC is the Radio Resource Control that works as Control Plane in Layer 3. Is used primarily for Signaling in UMTS. Then we can compare with the signaling in GSM, as the Immediate Assignment process for SDCCH resource allocation. RAB is the radio access ‘transporter’ that works as the User Plane to provide data for the services requested by the user. Then we can compare with the user part in GSM, as the TCH Assignment. For each service requested by the user we have only 1 RAB. For example, if the requested service is a Voice Call (CS-AMR), then 1 CS RAB will be generated and provided to the user. The same is true for PS. To complete for today, let’s see (always in simplified form) a simple RRC connection and RAB. Whenever the UE needs the UTRAN resources, he asks. So that these resources are allocated, it establishes a RRC connection with some SRBs. 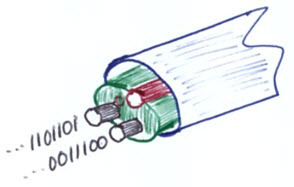 In this case, a RAB connection is created to enable the transfer of user data. We remind you that the RAB consists of RB + Iu bearer. The RAB is created by CN, with a specific QoS request. For a single UE, there may be multiple RAB for NAS service (CS or PS). But let’s just stick to the initial procedure, that is, how is performed the ‘RRC Setup’ procedure, from the UE’s request. The following figure shows this more straightforward. If all goes well, the UE sends the message in the Uplink: ‘RRC CONNECTION SETUP COMPLETE’. And after this, the ‘MEASUREMENT CONTROL’ message are being sent in the Downlink, for the communication continuity. After the RRC connection is established, the UTRAN makes the checks between the CN and the UE, for example the authentication and security operations. And so, the CN informs the RAB to UTRAN in accordance with requirements of the service requested by the UE. As we have seen, RAB occurs after the RRC, and without a RRC connection no RAB may be established.